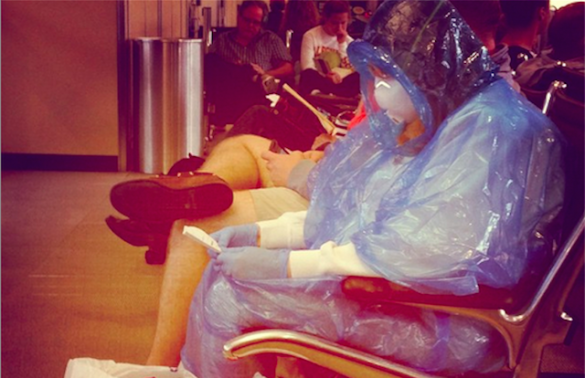 Some Washington Dulles passengers took preventative measures into their own hands. One Washington Dulles Airport traveler had a very bad day Oct. 13. The middle-aged woman who had just returned from a West African country was immediately served with an outstanding arrest warrant from Maryland. But, her troubles didn’t end there – she caught a slight fever while awaiting extradition at the Loudoun Adult Detention Center. Measures of great precaution ensued. Luckily, INOVA Loudoun Hospital physicians cleared her of posing any risk to others and she was able to leave Lansdowne hospital on Oct. 17. Nevertheless, her bad day could have wreaked havoc on the thousands of Loudoun residents and airport travelers left in her wake. As a gateway to the U.S., and the world, Washington Dulles Airport has been under mounting pressure to set a safety precedent. The airport this week launched a new layer of entry screening for all travelers from the Ebola-affected nations of West Africa as fears of the deadly Ebola virus continue to spread. 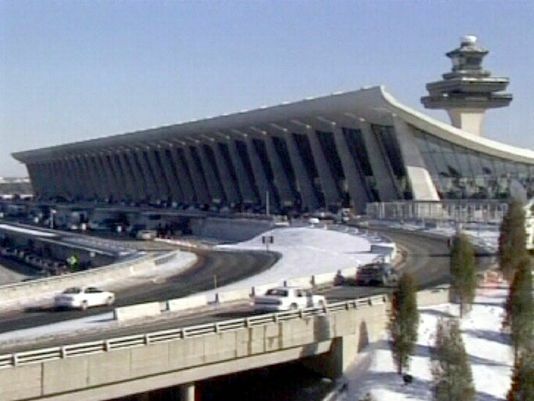 Washington Dulles International Airport is one of five international airports to receive passengers from Ebola-infected West African nations. On Oct. 9, the U.S. Center for Disease Control and Prevention together with the Department of Homeland Security’s Customs & Border Protection announced it would beef up security at Dulles, New York’s John F. Kennedy and Newark International airports, Chicago-O’Hare and Atlanta. The five airports welcome nearly 95 percent of all travelers from Ebola-effected areas. Only 150 people from West Africa travel to the U.S. daily, according to customs officials. Still, that won’t stop trained staff from looking out for incoming West African passengers who may show signs of the illness. Travelers will have their temperatures taken with a no-touch, infrared thermometer at a pre-determined screening site. If a fever is evident – one of the first signs of the deadly virus – they will be taken to a CDC quarantine station for further review. If not, they are free to go, but will be encouraged to self-monitor for symptoms. The extra measures should come as welcome relief to Loudoun residents who have already had their fair share of Ebola scares. In addition to the middle-aged inmate, United Airlines confirmed earlier this month that Thomas Eric Duncan had made a layover stop at Dulles before heading to Dallas/Fort Worth International Airport. Less than one week later, Duncan became the first Ebola victim to die on U.S. soil. Loudoun officials are taking the threat seriously. Ebola is not an airborne illness, but is transmitted through human-to-human interactions. It has an incubation period of two to 21 days and therefore humans are not infectious until they develop symptoms, according to the World Health Organization. Symptoms have a sudden onset and include fever fatigue, muscle pain, headache and sore throat followed by vomiting, diarrhea, rash, impaired liver and kidney function and sometimes internal or external bleeding. Nearly 4,000 people have been killed by the virus in West Africa, but Duncan is the only person who has so far been diagnosed and died of the virus in the U.S. Shortly thereafter, a Dallas area nurse was positively diagnosed with Ebola, but she is expected to make a full recovery. Despite the extra layer of security, some passengers are taking prevention matters into their own hands. A viral image circulating various social media shows a Dulles passenger donning a homemade plastic hazmat suit and face mask – an image you would expect to see in an episode of Breaking Bad, not in one of the nation’s top airports. Fear has prompted the top Loudoun health official to make assurances that the risk of Ebola spreading widely here is low. “It’s important to remember that people with Ebola cannot spread germs until they have symptoms, and that the disease is spread through direct contact with the bodily fluids of a person who has Ebola,” said Dr. David Goodfriend, the Loudoun County Health Department director. Duncan did not show symptoms when he traveled through Dulles. The Loudoun Health Department is part of a network of health agencies that routinely share information on disease management and control. Still, citizens can take precautions to fight any deadly illness; Regularly wash your hands, cover coughs and sneezes with your elbow, get routine flu shots and avoid anyone who is sick.